Help Make Farmstead Cheese Available to More of Us - JP loves LIFE! Buying products that clearly show which farm they originated on or even straight from the farm has become a driver for many Americans. To do that, many farms have been doing some creative things to help make those connections more common. My very first memories are of being around cows. They make milk and that milk was transported off to some other facility where they processed it. That was all I knew and grew up with. I always though, had in the back of my mind that I could make something with my milk! Life moves forward and time goes so quickly. As my kids grew and became independent, I started to really think again about making something, making a bit of a “mark” so to speak. Reinventing my creative side was really where I wanted to head. I LOVE, LOVE, LOVE cheese…so why not make that? I have my own cows and they make wonderful milk. via From Cows to Milk; I Want To Make Cheese! That Is My Dream For My Dairy! « A Dairy Goddess’s Blog. If you want to see how incredible creative she is, you will have to go to that post and check out the slide show she has there. It is SO BARBARA! It didn’t take long and she had made investments and had a cheese business up & running. The local TV station KSEE did a spot on the accomplishment and Barbara’s use of social media. Over the almost two years Barbara has been making her now famous Dairy Goddess spreadable cheese, I have kept track of her progress and wondered when I’d get to taste it myself. I’m still not there yet. 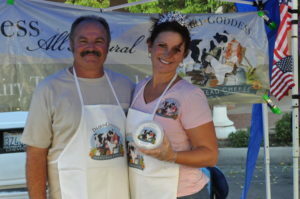 Need to get to the Central Valley or nearby — Hanford Farmers Market is one of the more than a dozen farmers markets carrying the Dairy Goddess’ products! She’s also in three specialty stores and Whole Foods Fresno. Last week, I saw this Facebook post by friend & neighboring dairy farmer Dino Giacommazzi. Hey Facebook friends, if you are willing to skip a couple of Starbucks this week and send a few dollars to the Dairy Goddess, she might be able to get some of the world’s best spreadable cheese to a store near you. I have to be honest, I sometimes eat this cheese straight from the tub while watching TV. Every time, I have eaten the entire tub in one sitting. Sometimes I skip the crackers because it takes too long….I eat it with a spoon. It’s good stuff.. Now go donate some $$. It has nearly been two years since Dairy Goddess Farmstead Cheese/Milk started making and selling cheese. Most recently I have started selling a Non-homogenized / Lightly Pasteurized Whole Milk and Whole Chocolate Milk. Happily, it has been a huge hit. I received a call from a large distributor. They want Dairy Goddess Cream Top Milk / Cream Top Chocolate Milk and Cheese. As many of you know, we are 3rd generation dairy farmers. Dairy Goddess was built to help our farm. These past few years for the dairy industry has been brutal. Hundreds of California dairies have closed the doors since our Real California Dairy Ad campaign. With that being said, capital is nearly impossible. So, I am reaching out, asking humbly for your help. To grow further and fulfill large orders I need refrigeration for my plant as well as a refrigeration van. I know I am asking a lot. I know many, many people are struggling. I ask you to spread this to your business contacts or someone who might have an entrepreneurial spirit. If my goal is not reached. It’s OK. I need milk crates and more ice chests and regular storage, labels, bottles etc etc etc. Dino is right. A small contribution from me and others can mount up to the big difference for the expansion. And one of you may be looking for an innovative investment…. a way to encourage farmers to be creative in delivering products to us. If that’s the case, please get in touch with Barbara through her gofundme page or shout out here. For kicks & giggles, I think maybe I should add her fun slideshow about her dream here…. It just makes me smile! 🙂 And I love knowing that she has realized part of her dream and continues to dream bigger! Sing along if you like! Janice…Thank you so much for this great post. I am actually moved to tears as you allowed me to reflect on what I have done this past couple of years. Sometimes being so busy…you forget. You don’t take the time to appreciate the journey. I appreciate any help at all. With the help I have received thus far. I have ordered milk crates and additional bottling. This gets me closer…help in any shape moves me to my goal. I felt over whelmed and stuck. How do I get to the next level? So I took a leap and reached out. Social media is a great gift. Being able to reach out, people, many that you haven’t met in person, reaching out and helping. These friendships created online…in this cyber world they are warm and genuine. God bless you Janice, this means more to me than words can say. Glad to lend a hand….. just wish I could get closer to you for a visit. Spent last week in Sacramento area & then spent 24 hours in Orange County with a dear friend I’ve been missing. Fresno/Hanford were just out of reach. I do markets in the LA area. I often travel North too….let me know next time you are out here. Would love to meet up and bring you some cheese and milk!